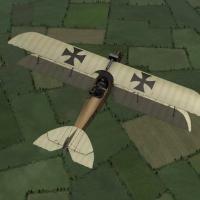 The Oeffag C.II was a two-seat Austro-Hungarian plane introduced in mid 1916. 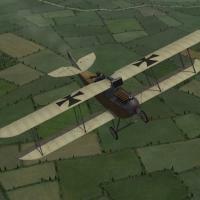 It was intended to replace the Hansa-Brandenburg C.I. 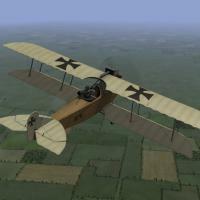 Pilots considered it a better plane, but it wasn't as maneuverable, and did not completely replace the Hansa-Brandenburg. The Oeffag C.II was armed with a single machine gun and was used primarily for reconnaissance, but could also carry a small bomb load for infantry support missions. It was used mostly on the Eastern Front, but also served on the Italian and Baltic Fronts. My version has two skins with an early and a late insignia scheme. There is a complete set of number decals and a loadout for a small bomb load. I have included my skinning templates with the download. 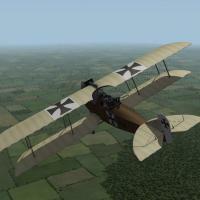 Historical Note: The Oeffag C.II could carry four 10kg bombs, which were carried in the cockpit and dropped over the side by the observer. In my plane, I mounted them on a bomb rack under the fuselage. My thanks to Ojcar for making the FM file for this plane. My thanks also to Nix for making the sound for the Austro-Daimler 160 engine. 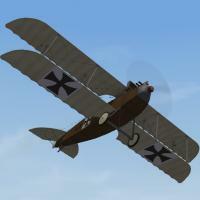 Note - The engine sound for the Austro-Daimler 160 has been used with other planes so you may already have it installed. I have included it with this download in case you don't have it yet. For FE1: Unzip the file and move the folder named "OeffagC2" into the FirstEagles/Objects/Aircraft folder. If you don't already have it, you also need to move the sound file "Austro-daimler160.wav" into the FirstEagles/Sounds folder. For FE2: Unzip the file and move the folder named "OeffagC2" into the FirstEagles/Objects/Aircraft folder. Then in the FirstEagles/Objects/Decals folder, create a new folder named "OeffagC2". Move the folder named "D" from the Aircraft/OeffagC2 folder into the Decals/OeffagC2 folder you just made. If you don't already have it, you also need to move the sound file "Austro-daimler160.wav" into the FirstEagles/Sounds folder.